Pumpkin decorating is a really fun activity for kids, and we decided to do things a little differently this year. 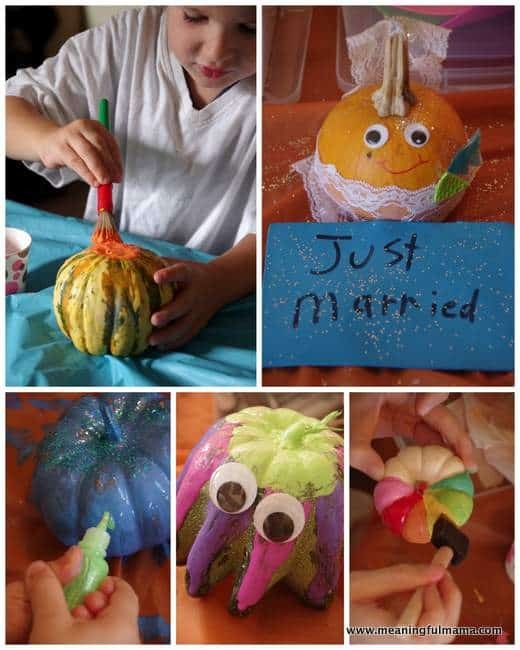 Hopefully this pumpkin decorating idea for kids helps inspire some creative time with your own family. What I love about what we did this year is that it was all very open ended, which resulted in the kids using their imaginations for their own creations. 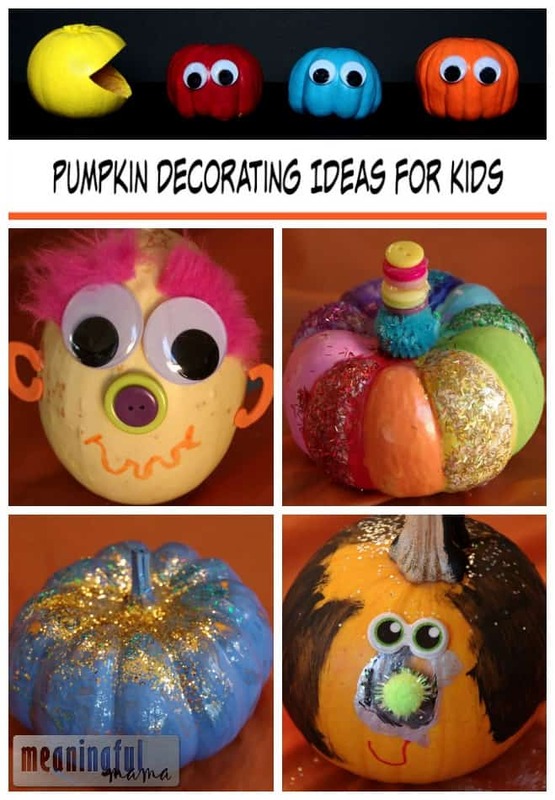 Some of my favorite pumpkin carving ideas from the past include my two-toned polka dot pumpkins and our Sesame Street pumpkins in case you are out searching for other ideas. The kids had a blast having the freedom to just create. I love having crafts planned for the kids with a specific goal in mind. However, I am finding that my kids (especially my oldest) wants less of a plan. She complained to me one day, “We are always doing stuff for the blog.” I responded, “I thought you loved doing crafts. You know you never have to do them with us. 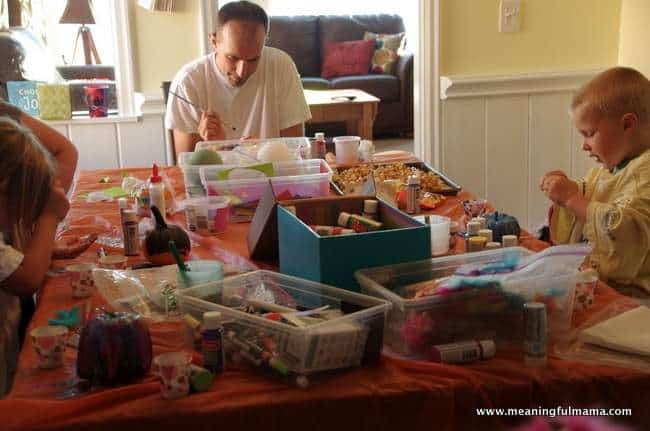 It’s just an option for fun stuff to do.” She said, “I do love doing crafts, but I want to make my own ideas.” That thrilled me. Of course I want her to participate in what I dream up, but how exciting is it that she is starting up to dream up her own creations? It is fun to watch her brain work, and I want to foster her own ideas. This experience was open ended and all the kids responded well to it. 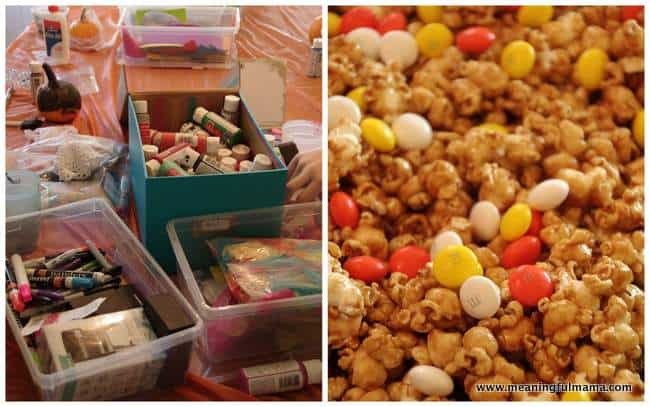 The table was not only filled with craft supplies, but I made up some of our delicious 15 minute microwave brown bag carmel corn for the kids (OK – and maybe the adults too) to snack on. I combined it with the white chocolate candy corn M&M’s, and we really couldn’t stay away from it. When I saw the little squiggly pumpkins, I knew I had to create these Pac Man pumpkins. It was the first thing I thought to do when I saw their unique shapes. Whatever you do with your family, I do encourage you to let kids explore some of their own ideas. I also hope you are taking moments this fall to create memories and traditions.